Develop Ola Like(Ola Clone) taxi booking app to give a tough competition to Uber. Ola app giving a tough competition to Uber with its cars for every occasion, you can also make it big through taxi booking app development! Taxi booking app is not a word which is unheard of these days. Like Uber, many other companies have joined the ride-hailing business and are slowly gaining popularity. One of them is Ola cabs which is really proving itself as the toughest competitor of Uber in the Indian territory. OLA is a transportation network company of Indian origin. It was founded in December 2011 as an online cab aggregator in Mumbai by Bhavish Aggarwal and Ankit Bhati. It is now based in Bengaluru. In March 2014, Ola acquired Bengaluru based taxi service Taxi For Sure for approximately $200 million. In June 2015, Ola users were given access to the on-demand cabs through the Ola app. Ola Play, which was launched in 2016 became the world’s first connected car platform for ride-sharing. It was an innovative approach to revolutionize commuting experiences across the globe. In the year 2017, Ola also acquired a food tech company called Foodpanda to get into the food delivery business. Later, in 2018, Ola also took over Ridlr which was formerly called Traffline. It is a public transport ticketing app. The scooter rent startup Vogo was funded by Ola in which Ola invested $100 million. In March 2019, Ola raised a funding of $56 million from Tiger Global and Matrix India. It has also raised $300 million more in the same month from Hyundai and Kia. Ola’s business is said to be valued at $5.7 million. Ola has expanded its network on a large scale and has more than 10,00,000 vehicles in around 110 cities. It is slowly expanding its market in Australia, New Zealand, and the UK. Ola is trying to get its unique expertise in solving urban mobility challenges to New Zealand at reasonable prices. The rides are designed to help you save more even when you get high-quality rides. 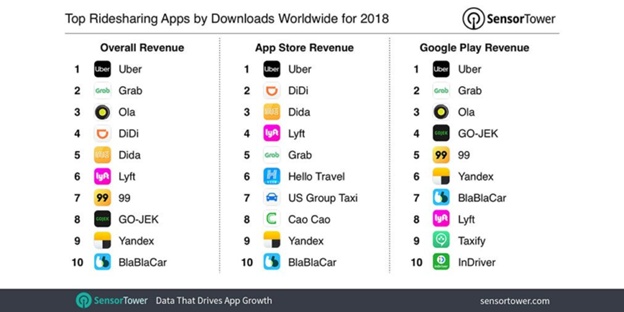 Ola ranked 3rd in the Top ride-sharing apps downloaded across the world in the year 2018. Ola has an option for fulfilling each of your needs. 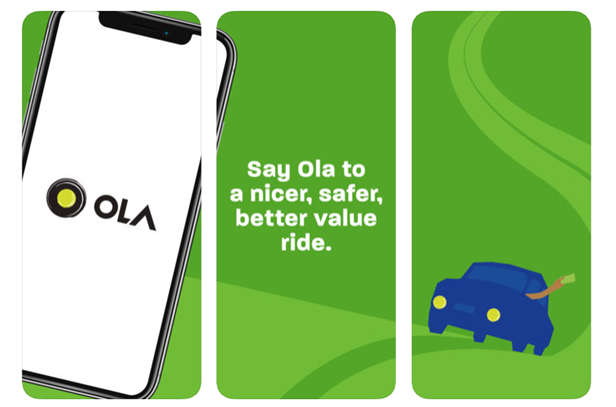 Basically, Ola has three types of car rides to offer. The city taxis, inter-city cabs, and local cabs at hourly packages. The city taxi option in the ola app provides you a comfortable travel option for your everyday needs. These city taxis are available 24/7 and can be booked in a fraction of a second. They provide a wide range of options and even support carpooling with Ola share to contribute towards the environment. The outstation taxis are able to take you out of town with affordable prices. The users are able to choose from a wide range of AC cabs available for their one-way ride. The rides are available across India and have around 500 routes. In this category, the cars are available at the user’s disposal for a one-day long office meeting or a shopping trip. They are available for 1 to 12 hours on rent. What is special in Ola that you can use while developing Ola clone app? The ola cabs provide all types of cabs right from SUV to Sedans. They also provide cars for special occasions at reasonable rates. The app lets you ride a Prime Sedan at small fares without you having to wait for a single moment. The prices for booking these cabs are pocket-friendly too. Ola cab drivers are properly verified for the security of passengers. The live tracking and the emergency alert button ensures that each passenger experiences an absolutely safe trip. The passengers can play music, watch videos and enjoy using Ola Play. The wifi in Ola cabs allows you to stay connected even if you are traveling through poor network area. Ola share has the lowest fares for one to travel. If a user wants to travel faster the Ola cabs also provide Share Express for some fixed routes. The passengers can choose their rides and travel hassle-free. Ola money wallet within the app is easy to recharge and allows you to go cashless. The users can simply add their credit/debit cards and pay easily. Like Uber, Ola also has launched its services for corporate travel. The company can manage your corporate travel on the tap of a button. You just need to sign up for your company to allow Ola to handle the rides for your employees. Add your employee on the dashboard. Your employee can book their own cabs through their own Ola cabs app. The ride payment is done automatically from the Ola corporate ride balance. You can track all the expenses and can download the invoices any time you feel necessary. Using Ola corporate helps you in saving 60% on your corporate rides. You can even have a hassle-free booking and better control over the rides. Ola corporate allows you to provide your employees with a safe, hassle-free and convenient mode of travel. You can even opt for the white paper solution to get Ola as your travel management partner. Auto: Auto at your doorstep without having to bargain at the cheapest rates. Share: 2 seats booking available to share AC cars with others traveling on the same route at 50% lesser rates. Share Express: Save time & money and avoid deviations. Mini: Travel in comfortable AC cars at affordable rates. Prime Play: Top-rated Sedans with free in-cab entertainment. Prime SUV: Spacious SUVs with more seats, free Wi-Fi with the best driversavailable. LUX: Travel in top-of-the-line luxury cars. Newest update: The payments can also be made using UPI ID in India. Is building an Ola like app really a good idea for your business? The technology has brought a huge change in the means of transportation and the way people think about travel. Having a taxi booking app can really make you reach thousands of people in one go. Though there is a tough competition in the taxi business, the scope of building an Ola-like app is really huge. The only thing that you need to make sure is that you offer something new and out of the box that people have never experienced before. Your taxi app must stand out from the sea of Uber-like apps available on the app store. At Coruscate, we have developed more than 500 on-demand apps out of which 200+ were designed for on-demand taxi booking apps. We have a record of absolute success in all our deliveries until today. Our research team works hard each day to find out the new features that can be introduced in the on-demand taxi app which would make it unique. If you wish to build a taxi app like Ola, you can connect with us for a free demo and consultation. With our latest technology and innovative idea, we can make your taxi app rank in the top 10 apps available and take your business to the next level of success.